I just love to start new series. It’s my collector’s compulsion at work. And although there weren’t that many pieces of my writing that were refused by editors along my professional life, exceptions always occur – and then what better use for a blog than also being a honorable, occasional Salon des Refusés? I must say I have just delivered two pieces of writing that were quite welcome. These pieces constituted important, political breakthroughs for myself regarding what I want to invest in writing architecture – ie, ever since I came to terms with the fact that we must kill the Tafuri within and return to operative criticism. I finished a lengthy text on the practice of Didier Fiuza Faustino for the catalogue of a forthcoming exhibition at the (totally unrelated) Salons du IFA. I also sent in my first piece of criticism for Domus #948 – in what I expect to be the start of a beautiful relationship. So, let’s say this is a moment in which I cannot but reflect again on the nature of an experimental writing on architecture. Dear reader, before you start to read this, you should be aware that this not your typical piece of criticism. Architectural criticism is recently being nailed at its crossroads, and the critic feels embarrassed by such an instance. She cannot but mirror this moment of truth. The critic sits at her office busy with her private quests and investigations. The critic has been trying to lose the label of being a critic. She has been refusing the role. She is aware of the uneasy stance of the profession these days. She prefers to see herself as a writer. She likes to write. A far from odd request suddenly lands on her laptop. It comes from afar, through a foreign intermediary. A magazine on the other side of the world requires a review of four recent buildings. There is a theme connecting the disparate objects: safety and emergency programs. The building that lies closest to the critic is not far: 461 km. Another one lies a mere 2,744 km away. The farthest is 3,713 km. Google maps says it would take 1 day and 15 hours to get there. The critic sits back and enjoys the prospect of a quick pan-european trip. She likes to travel. Romantically, she clings for a moment to an old-fashioned idea. Once upon a time, the critic had to experience the architecture to talk about it. She imagines traveling by car for 3 days, 21 hours and 10 minutes to visit these buildings. She could visit friends in Paris on her way back. “The speed and economics of the contemporary world have made me an analyst of visual culture,” she muses to herself. She looks at about 20-30 different buildings everyday. In this flow, she dedicates a few seconds to each work. One image is enough do dismiss a building. She finds herself amused to turn this exercise in visual information accumulation into a different mode of analysis. She remembers colleagues who dedicated painful amounts of time to compare plans and sections to photographic images of beloved buildings. She envied their patience. She looks at the images of one of the buildings sent to her in a zip file. It’s a fire station in Bergen. It dates from 2007 and it feels already dated. Dating an object, like one does in archeology, is a curious process. It says a lot. It says time is merciless. She reflects that the shape and materiality of this building could have arisen anywhere in-between 1987 and… 2007. To say the least. If you would be looking back on it 200 years ahead, this building would be simply undistinguishable. She sighs. What would future architecture archeologists dig out of this object? The last remains of an enduring Nordic modernism, mixed with a properly sustainable, vaguely post-modern design sensibility. Alvar Aalto turned into an honest, slightly boring middlebrow production. In distress, the critic turns to the architect’s description of his own building. She looks for redemption. He comes back with “magnificient views”, “the negative appearance of the traffic” and “the building as part of a future settlement.” She feels she is suffocating in obviousness. Maybe she is being unfair. Unconsciously, maybe the building speaks of a candid willingness to provide a last glimpse of architectural social welfare in a burning Europe. On the other hand, the critic realizes she probably longs for a fire station straight out of a Ray Bradbury novel. The critic is reminded of other fire stations. She visited Vitra’s many years ago. Zaha Hadid used to be a surprising architect – until her formal recipe killed her relevance. One could well dwell on the ironies of a fire station made out of languid concrete flames and acute blazing spaces. Zaha Hadid, Vitra Bas-Relief Model, via Arch Daily. She remembers delightful fire station towers that would mesh up different bits of city. To simulate emergency action, they would assemble disparate parts of buildings in an absurd functionalist fashion. True Colin Rowe collectibles. She takes a mental note for further research. This week, I’m going to Paris* to kick off my participation as a guest tutor at the ESA’s Studio 3X, where I follow after Peter Zellner and Enric Ruiz-Geli during this last semester of 2010-11 – while Fernando Menis, Riyaz Tayyibji and Alexander Brodsky took care of the first half of the year. 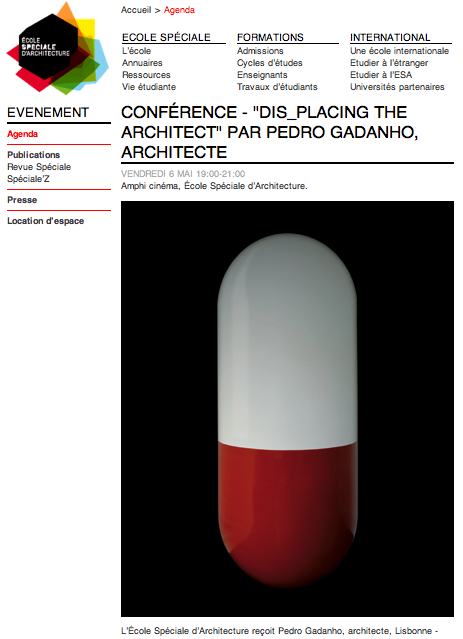 At this instance I’m also delivering a conference, this Friday at 7pm, on the theme of dis_placing the architect. While again playing with the idea of becoming a one-man band, I’ll focus the presentation on some of my curatorial projects that tackle changes in the nature of the profession today. As for the one-month course itself, I proposed the theme of Form Follows Fiction. Focusing on the project of a community centre in a socially problematic urban enclave, the exercise intends to explore how the teachings of fiction can translate back into spatial production, and how the exploration of life-stories can translate into relevant experimentation with program. At this instance, I’ll propose that one may depart from two different aspects of fiction taken as a critical tool: the reconstruction of reality’s spatial and social network through narrative (and architectural) devices, and the devising of future scenarios (and architectures) from symptoms and tensions which are present both in context and fictional texts. Just think of the conflation of the intricate spatiality of Georges Perec’s La Vie Mode d’Emploi with the plausible futurity of Bruce Sterling’s White Fungus and you’ll start to get the idea(s) where we will be departing from. *The asterisk signals the post’s soundtrack!